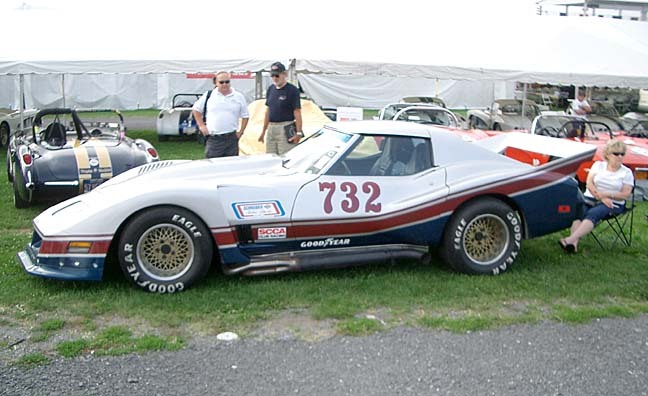 Corvettes at Carlisle 2004 is past but certainly not forgotten! As always this event proved to be the biggest Corvette gathering in the world. 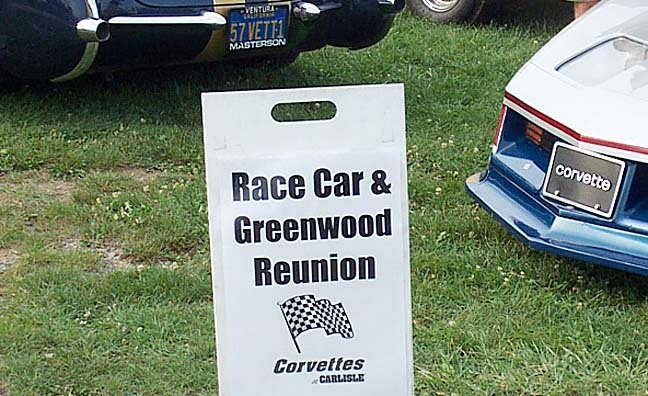 A success since its very first event, Corvettes at Carlisle has grown every year to the point where it has practically maxxed out the Carlisle Fairgrounds. With something for everyone, this Corvette gathering includes NCRS judging, Fun Field parking for Corvettes driven to the site, an auction, car corral, countless vendors, special displays, a Miss Corvettes at Carlisle beauty contest, road tour, a Women's Oasis, and a block-off-the-streets downtown party filled with America's Favorite Sports Car. In the Greenwood Reunion tent we were pleased to have the #3 Greenwood Daytona, brought from Chicago by Don Smith. This black on black car sports an updated Lingenfelter engine and Richmond five-speed transmission. As part of the Fun Field Display, Don's Daytona received a Celebrity Pick award from Mike Guyette, Greenwood Specialist. 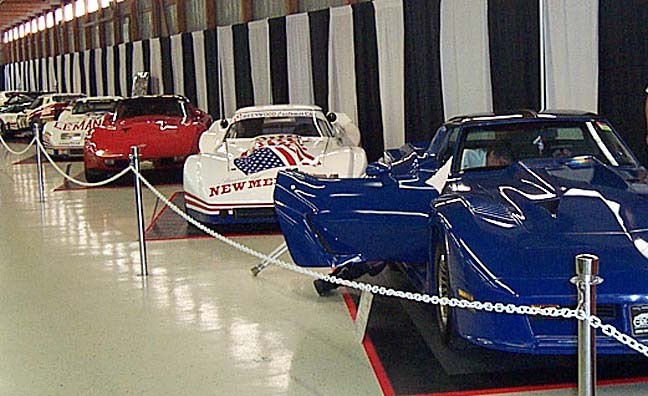 Daytonas #2 (blue/blue) and #4 (red/tan) were present in the Chip's Choice display, while Daytona #1 (red/black) resides in the National Corvette Museum. Also in the tent were Roger Abshire and David Rhodes, each with their Greenwood-competitive race cars. 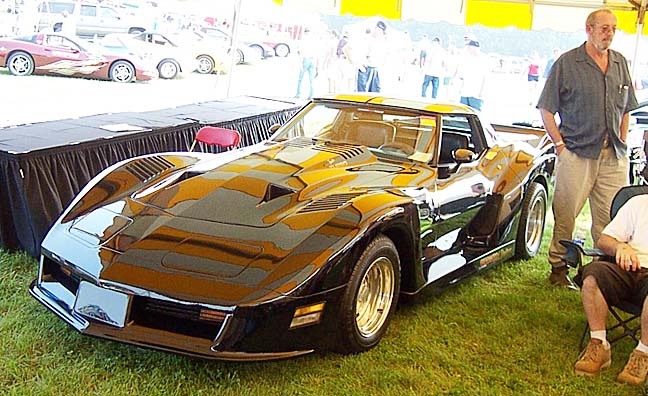 Although not official Greenwood customer cars, both had various Greenwood-designed items and reflected the hottest styling and competition trends of the mid-'70s. While Roger's silver and maroon #732 racer is practically street legal, he doesn't feel the need for (street) speed in this car as he has over thirty other Corvettes from which to feed his adrenalin rush. David's red-wine IMSA race car was fresh out of the paint booth, so numbering and sponsor decals had yet to be applied. David took on the restoration of this car his late brother started some years ago. If there's an award for the biggest, longest lasting grin ever displayed by a Corvette enthusiast, then David certainly deserves it. 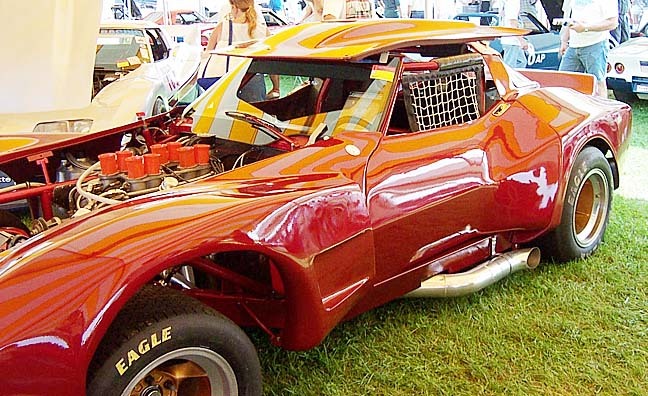 Not exactly a Greenwood car, the Eckler CanAm brought by Bill Valentine and Mary Lou Gray was a period piece that reflected the styling trend set by the Greenwoods' race, and hence street, widebody Corvettes. Ralph Eckler's interpretation of the café racers of the seventies resulted in at least two variations on the Greenwood Sebring GT series, and were aptly named the CanAm and CanAm II. 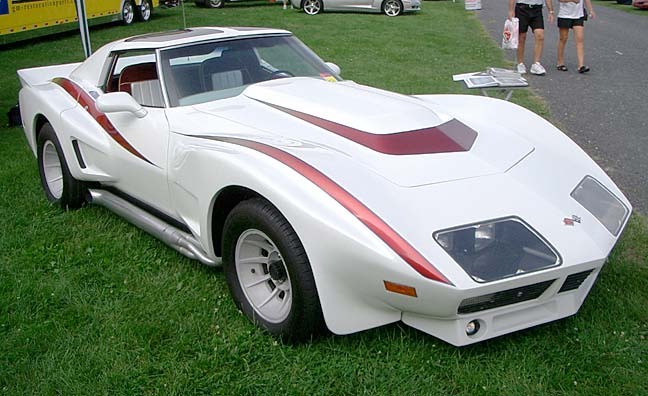 Bill and Mary Lou's CanAm from Hartford, CT appeared flawless in metallic white paint and period-perfect gradient striping. First timers at Carlisle, Bill and Mary Lou each brought their sons and all four vowed to return next year. Happy Daze Mary Lou! This year Tim and Joe Greenwood, sons of John Greenwood, took up residence in the Greenwood Reunion tent. They trailered up their C5 from Apopka, Florida, resplendent in their latest offerings for the C5 crowd. 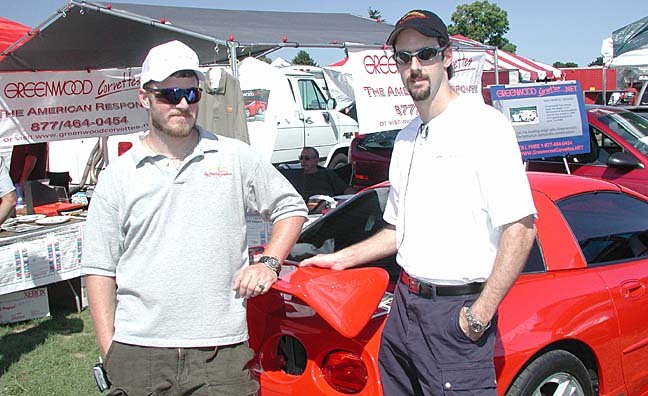 Their Torch Red coupe was bedecked with the newest in aerodynamic designs, and with a quality of engineering and construction only availble from the Greenwood family. Their C5 sported some of the most innovative ideas in aerodynamic design, and as always, each part has a function beyond mere beauty. The front splitter, for instance, is made from a high impact composite structure that is also retained by a cable system that will not deflect downwards at high speed, rendering it useless. The windshield fairing smooths out the airflow past the stock trim pieces, yielding a slipperier overall profile. The side skirts were designed as an aerodynamic aide in extracting front wheel well and underbody air. These side skirts are available with or without functional stock Z06 brake cooling ducts. The rear wing is a masterpiece of engineering, not only in its design but also in the simplicity of its installation. With machined aluminum bracketry mounting it to the rear frame, the G5R and RS wing can be mounted without removing the bumper. Said wings actually produce considerable downforce at triple digit speeds and handling improvements are noticeable at speeds as low as 50mph. The rear tunnel finishes off the body extensions by helping in the extraction of under-car turbulence and smoothing airflow. According to the Greenwood brothers, anyone with access to a lift, drill and basic handtools can install all these C5 aero-enhancements themselves. These pieces can be ordered in gel coat, primered or even painted. 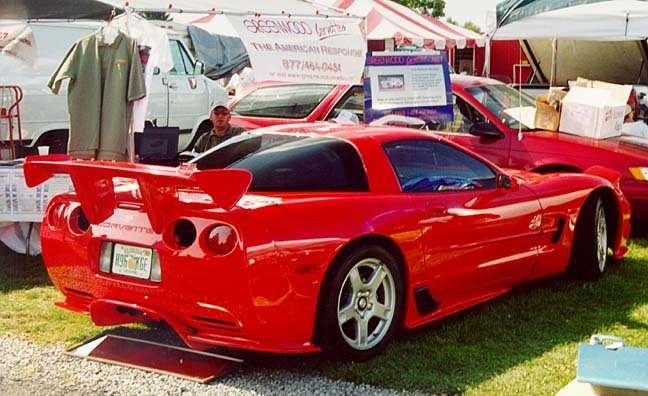 For more info on the newest body kits from Tim and Joe, visit them at greenwoodcorvettes.net.